Marijuana is not just a weed for getting high. It is a herb with nutritional and medicinal benefits--sedative, pain-soothing, and anti-inflammatory action. Marijuana is an analgesic or general painkiller making it a safe addition to palliative care to reduce the severity of symptoms. So effective is its pain-soothing action many call it a "new aspirin". Inflammation causes pain which is central to many ailments, like arthritis. Instead of pharmaceuticals many use marijuana to manage their pain. Foods we love can trigger inflammatory responses that exacerbate arthritis and other ailments. The problem is that classic edibles, like brownies, used by medical marijuana patients for pain management are made with the very foods--butter and chocolate--that trigger the inflammation. Marijuana Recipes & Remedies shows how to use canola other anti-inflammatory oils to make bud cooking oil. Marijuana tinctures, poultices and salves were widely used by physicians and folk healers before it was rendered illegal. 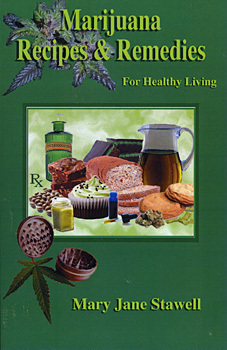 Marijuana Recipes & Remedies tells how to make and use these old-fashioned marijuana healing potents.